Here is my latest pattern. I just posted it on Ravelry. It’s call Simple Lines because of the elegant 3 x 1 rib stitch. It is a straightforward knitting project, suitable for new knitters. In fact, it has been test knitted by a fleet of new knitters from the Langley Weavers and Spinners Guild. Have a go at it and let me know what you think. They are so easy (and inexpensive) to make, you will make a fleet of them for all your friends and fashion needs. 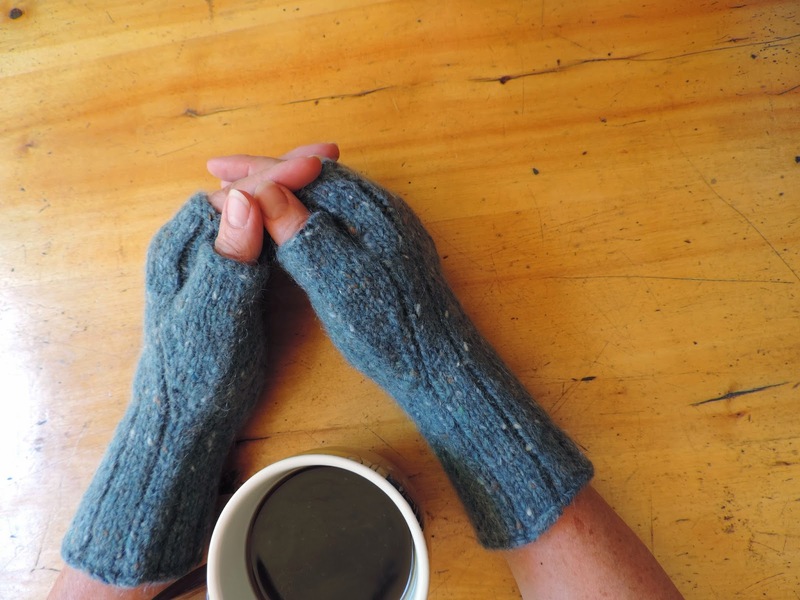 This entry was posted in half mitten pattern, knitting, Ravelry on August 2, 2014 by DianaTwiss. I love the month of July. It is a month of celebrating – starting with Canada Day on the first, then a nod to my roots – Independence Day on the fourth. A little over a week later, it’s my birthday and after that my wedding anniversary. In the middle of that is the charming Aldergrove Fair. And to top it all off, July is when I usually manage to organize my summer holidays and get a few weeks off work. Delicious. Fibre-wise it’s been a good month. 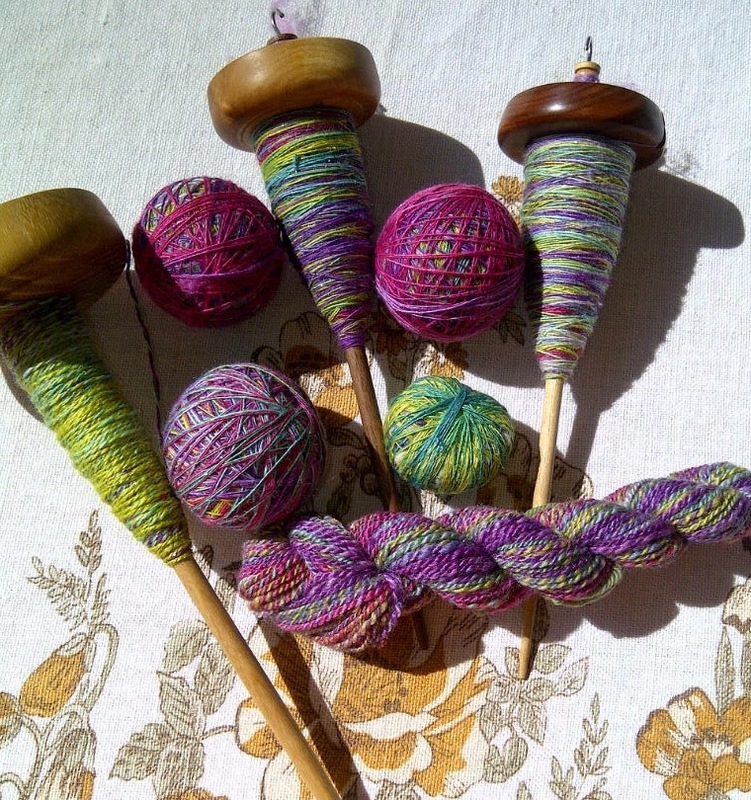 I’ve got a good start on spinning and plying the July Fibre Club. I’ve reclaimed some local Cormo and am in the process of cleaning it, again. That will be a separate blog post. But the biggest accomplishment for me this month is that I have changed the way I knit. I learned to knit when I was 10 and since my mid-teens I’ve been a steady knitter. So why would I change now? I love making yarn almost more than anything. I mostly knit when I am tired of spinning or when I am commuting. I am amazed at the production of some knitters and when I get to the roots of their speed, one common factor is the way they throw their yarn. They are knitting Continental – throwing with their left and picking the yarn to make the loop. I knit English style which is to throw with the right hand and wrap the yarn around the needle before you pull it through. It isn’t efficient at all. I learned how to knit Continental style at the insistence of Lucy Neadby. At a knitting workshop she showed us some of the best ways to get a smooth and consistent fabric when making intarsia or knitting fair isle. That was to hold one colour in one hand and the other colour in the other. Thus the need to be able to throw with what ever hand/colour was needed at the time. So I know how to do it, but I only did it when I did colour work. But suddenly I wanted to see if I could knit faster so I could get through more yarn. That’s when I decided to knit Continental, and Continental only beginning with a lovely little project – baby socks. The pattern is by Kate Atherley and it’s free on Ravelry. It was a quick easy project and one that I could focus my new knitting skills upon. You start with a 2 x 2 rib stitch so it was good to get practice with knitting and purling right from the start. But it was frustrating at the beginning. On my commute to the city, knitting my usual way I could easily have finished the cuff/leg and even had a good start on the heel flap. But not this time. I barely had one inch of knitting to show. Nonetheless, I didn’t give up. Ever time I reached for my knitting, my hands would go into the English throw position, and I had to readjust. By the time I was onto my second sock I was getting a bit faster, at least more comfortable with it. I finished those socks and quickly moved onto another pair. That pair went much faster than the first, but still it didn’t seem as fast as my other knitting. Now I am onto a third pair and I am happy to report that I can now do the knit stitch without looking. It’s just coming quite naturally. And the purl stitch is actually fun, and easier to do than the English style. Lesson learned: You really can teach an old dog new tricks. 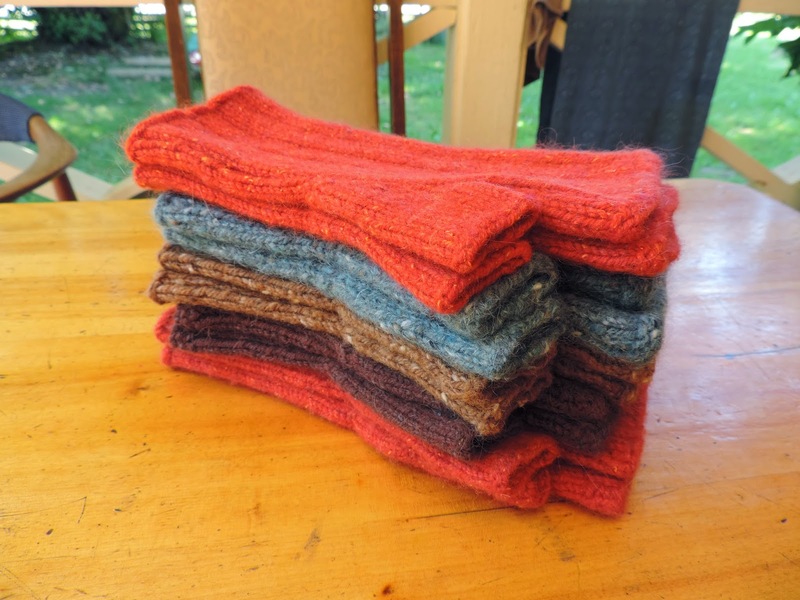 I wanted to change the way I knit and so I focused exclusively on changing the way I knit. When it got tough I either put it down for a spell, or just persevered. The change didn’t come over night. It took a while for my hands and my brain to get used to it. I noticed that every morning when I picked up my knitting, it was just was wee bit easier than it was the time before. Here’s the first pair I knit next to the parent pair that used the bulk of the yarn. Aren’t they the sweetest things? 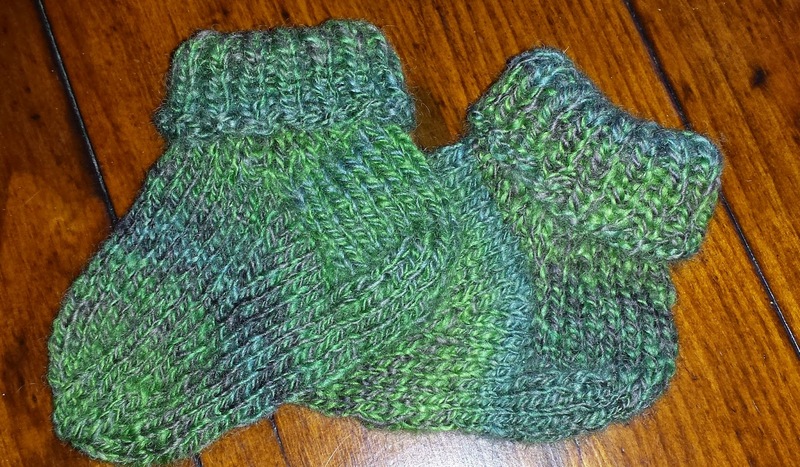 And here’s a photo of the second pair of socks I knit from leftover handspun. Great pattern – these are the newborn size and used 20 grams of yarn. That’s it for July. Welcome August and all the new fibre adventures it will hold. This entry was posted in handspun yarn, Kate Atherley, knitting on August 1, 2014 by DianaTwiss.